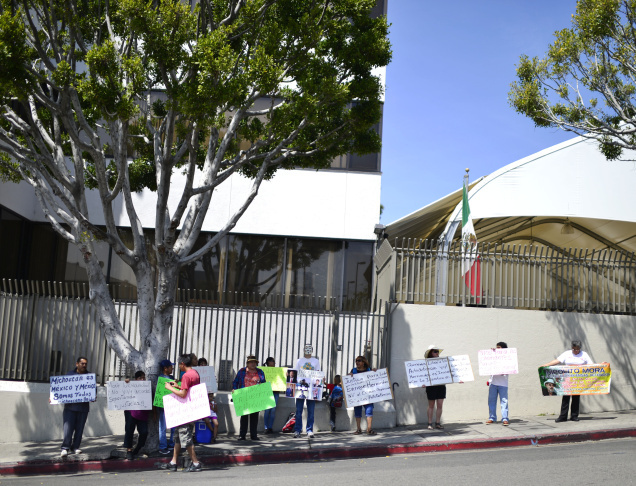 Lucy Sanchez demonstrates in front of the Mexican consulate in Los Angeles Thursday. Sanchez's cousin was recently arrested by police in Michoacan State in Mexico. Demonstrators gather in front of the Mexican consulate near McArthur Park in Los Angeles Thursday on the one-year anniversary of a massacre of farmers in Michoacan State in Mexico. Demonstrators gather in front of the Mexican consulate near McArthur Park in Los Angeles Thursday on the one-year anniversary of a massacre of farmers in Michoacan State in Mexico. 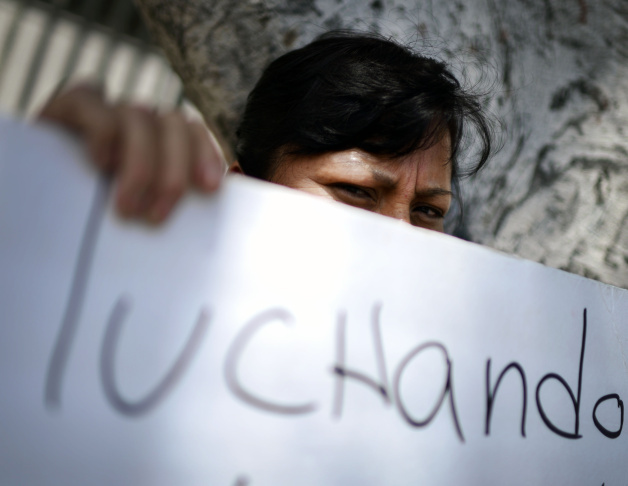 Aviles Luliana holds a sign Thursday in front of the Mexican consulate in Los Angeles as part of a demonstration against violence in the Mexican state of Michoacan. 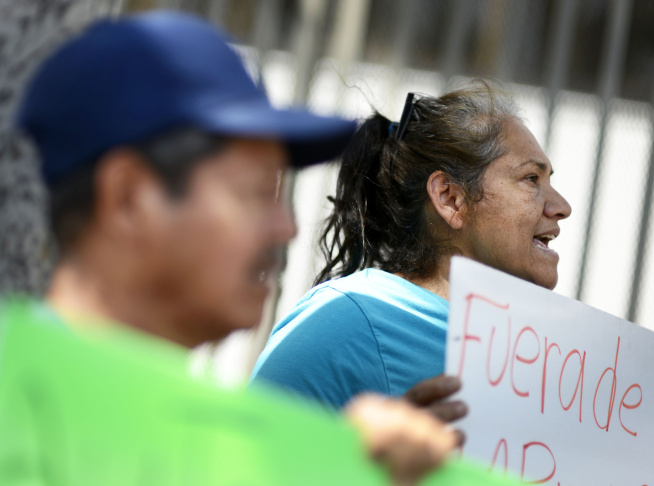 Demonstrators gather in front of the Mexican consulate near McArthur Park in Los Angeles Thursday on the one-year anniversary of a massacre of farmers in Michoacan State in Mexico. Genesis Godinez, 55, right, protests in front of the Mexican consulate in Los Angeles Thursday. Godinez and about two dozen others marked the one-year anniversary of a massacre of farmers in Michoacan State in Mexico. Demonstrators gather in front of the Mexican consulate near McArthur Park in Los Angeles Thursday on the one-year anniversary of a massacre of farmers in Michoacan State in Mexico. 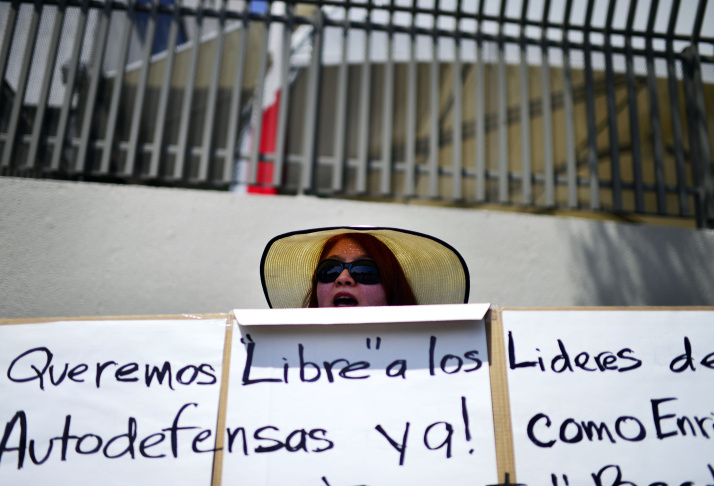 Lucy Sanchez, right, demonstrates in front of the Mexican consulate in Los Angeles Thursday. Sanchez's cousin was recently arrested by police in Michoacan State in Mexico. 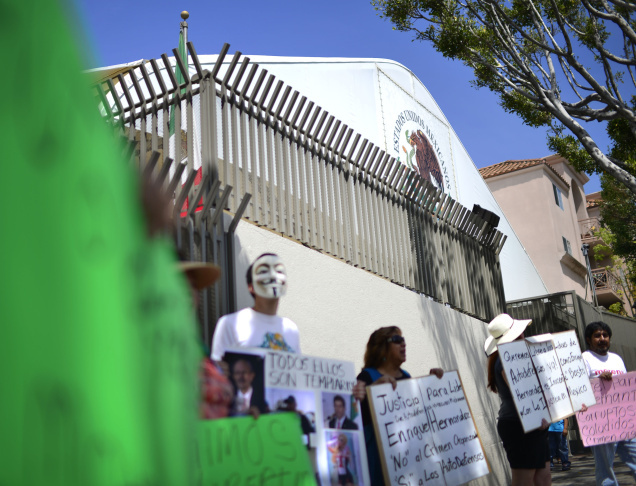 Demonstrators gather in front of the Mexican consulate near McArthur Park in Los Angeles Thursday on the one-year anniversary of a massacre of farmers in Michoacan State in Mexico. In Los Angeles, families with close ties to the Mexican state of Michoacán are playing a role in an effort to end the violent drug conflict in their home country, spurring a debate over the armed civilian groups that have risen to counter drug cartels. The armed groups — known as autodefensas, or self-defense groups — have emerged as a potent force against the dominant drug cartel of the region, the Knights Templar. Their success in driving out the Templars from key towns and cities in Michoacán has drawn support, but it has also raised questions in a region where the central government has lost control. "The state of Michoacán has become a key battleground," said Brad Rowe, a public policy analyst at UCLA who specializes in drug violence in Mexico. "It’s a key crossroads for drugs to be moved through and there has been a huge shift in leadership in the drug trafficking organizations that work in the area." About a year ago that began to change, when civilian groups began to take up arms and challenge the drug cartels themselves. In February, the groups seized key towns and cities and pushed out the Knights Templar. They've drawn support from civilians, both in Michoacán and in L.A., and several leaders have ties to California. On a recent afternoon, Daniel Gonzalez, 50, a resident of Pico Rivera, spoke by phone to his daughter who lives in Tierra Caliente, the region at the center of the violence. He was concerned about a recent video she sent in which residents described abuses from the Knights Templar. "Yes, we’re afraid, both my wife and I are scared," said Gonzalez, whose grandchildren, sister and 92-year-old mother all live in Tierra Caliente. "But someone has to do this kind of work." The government has tried to exert control by assigning a new head of security to Michoacán and pledging nearly $3.5 billion in aid. But it’s also been ambivalent about the self-defense groups -- at one moment sanctioning their efforts and the next, cracking down on certain factions. 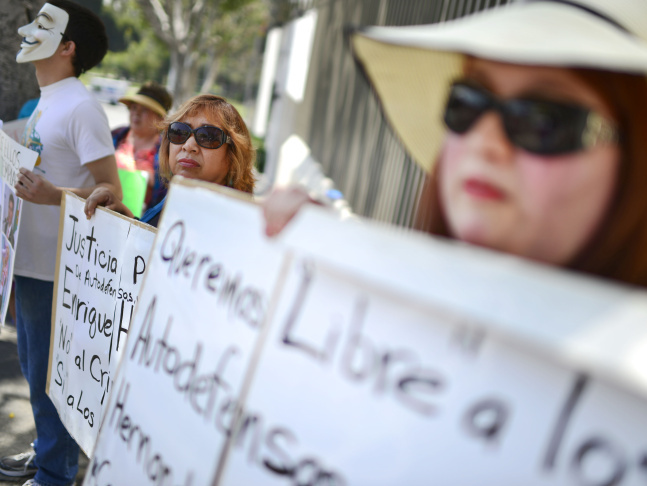 The recent arrest of one popular leader drew protests by michoacanos in front of the Mexican Consulate in Los Angeles. One of those demanding support for the autodefensas was Genesis Godinez, 55, of Fontana, who said she is in regular contact with her family in Michoacán. "We have to keep fighting against the criminals," she said. "We just can’t continue the way that things are. If the government doesn’t do its the job, then let us do it." But not all are in agreement. At the protest an argument erupted when a man approached the protesters. He said the solution to end the violence would have to come from more than a choice between the government forces and the autodefensas, both heavily armed. "I don’t support any of the two," said Pablo Hernandez of Santa Ana. "Let me tell you this: a bullet out of one of them kills just the same as if it comes from the other. And in a crossfire, what’s going to happen? Innocent people like us would fall." The michoacano community in the U.S. has deep roots in the States and close ties to Mexico. 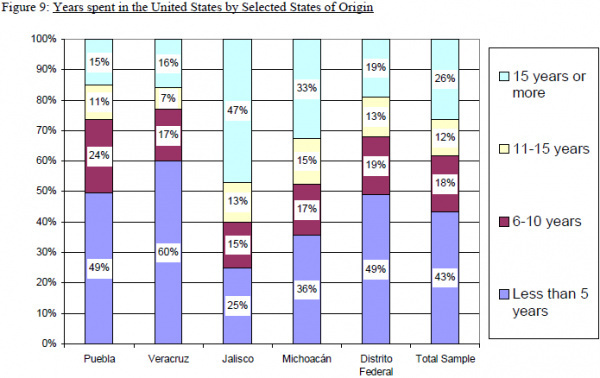 The graph below shows the average time immigrants from the U.S.'s largest Mexican communities have been in the States. About one third of michoacanos in the U.S. have been here for over 15 years. Slightly over one third have arrived in the past five years. Will Facebook be entering the money transfer world? LA Register Debut: Does Los Angeles really need another newspaper?